We wish to thank all of our customers for visiting us on “Small Business Saturday”. Our team works very hard to give you a better experience than the “big box” or online stores. We’d like to think that every day is a “small business day”. 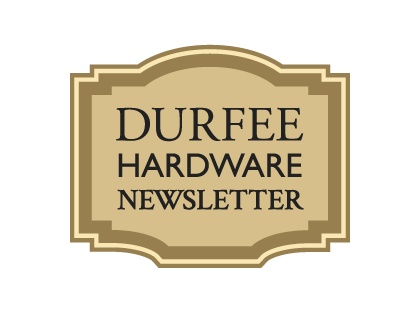 Durfee Hardware has been family-owned, and in the same location for 88 years; and we expect to stick around for at least another 88! Don’t forget to come by Durfee’s for all your Holiday needs! By the way, I personally have the driver bit set that is on sale this month, and it is great! Lots of people don’t like old buildings, but I don’t feel that way. Maybe your house is old and it makes you crazy. My old building is the hardware store. As I mentioned above, the original building was built in 1930, with an addition built shortly after in 1933 (a second addition was also built in the 70’s). I actually get a lot of satisfaction as I go through the store. I see stuff that I know my grandfather, Clarence built. I certainly see stuff my dad fixed. What made me think of this is that we have a repair bench in the basement that we do the lamp repair work on. I was working with my bother Paul down there and remembered that I built that bench area to work in when I was a teenager (for those of you that know me, that was a VERY long time ago). So, I guess I’m saying that all of these various repairs and improvements done over the years are nice to have around as a reminder of the jobs well-done, and to get satisfaction that you made something that lasted. Who knows, maybe a future grandchild will get a kick out of that workbench! We are working on a new sign for the store so I joined a number of 5/4 x 8” oak boards together with my biscuit cutter. I used this crazy good “Titebond” waterproof glue so that the joints will last. I’m sure you’re tired of me writing about my porch repair, but I have three porches around my house so… one down, two to go. I have been doing a lot of tree and wood cutting with the chain saw around the house recently as well. Unfortunately, I have a terrible cold. You can try, but you just can’t buy enough Clorox wipes to keep everything virus-free. I bought a hot tub because I have some knee issues and using it feels great to alleviate the pain. It is getting pretty old and some of the internal wood supports have rotted. I replaced them with plastic and stainless steel multipurpose screws. Now those little voids that the mice could get though are all plugged up. No more electrical issues for me!